Home Starting a Business Startup Stories Startup Stories: Turning NO into a YES Bar! Startup Stories: Turning NO into a YES Bar! The YES Bar is a gluten free, paleo friendly snack bar. What’s in it? Buttery macadamias, Vermont maple syrup, tart cherries, sweet apricots, and bursts of dark chocolate among many other certifiably delicious REAL FOOD ingredients. It is an exquisite blend of nutty, chewy, sweet and salty goodness that will delight your inner foodie. A good source of fiber, with 4 grams of protein and 170 mgs of omega-3s, our bar is not only delicious, it’s a nutritional powerhouse that’s easy to say YES to! 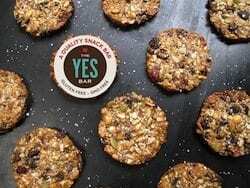 Even with all the many many snack bars that are out there in the world, there really isn’t any other bar just like the YES bar. The YES bar is 100 percent real food, and you can taste the difference. It has bold flavors, and complexity. With a texture that gives your mouth something crunchy and chewy to enjoy, it sort of tastes like a wholesome sweet and salty buttery cookie. But here’s the thing: we have no soy, no dairy, no gluten, no grains, and no GMOs. So we appeal to many people on a restricted diet, but the bottom line is we just taste AMAZING. Even without all that stuff. The YES Bar was born about three years ago in our kitchen in Laurel Canyon, California. My younger son had a lot of food sensitivities at the time, as well as a few health challenges, and I found myself constantly having to say “no” to things he wanted to eat. It made me sad, and I vowed right then and there to whip up a treat so delicious, and so healthy that anytime he asked for one, I would be able to say a resounding YES! I collected all the healthy yummy foods I could find in my kitchen that were all naturally free of gluten, dairy, soy, and corn. I started with nuts and seeds. I added some honey and maple syrup, some pure vanilla bean powder, some cinnamon, some dried fruits, and coconut butter. I added hemp and chia for an extra dose of nutrition. And then I threw in dark chocolate, well, just because chocolate is awesome. I experimented for months til these little portable yummies had just the right consistency. From day one, even before they were perfect, my son loved them. My other son loved them. Our friends who came over loved them. My husband loved them. He started using them for his 50 mile bike rides. His cycling buddies wanted some. We brought them as snacks to birthday parties and other people wanted to buy them. We went to some local stores, and they loved them, and wanted to sell them. We all know we should eat healthy. But all too often healthy just doesn’t taste that yummy. Our whole goal was to make it easy for people to make the healthy choice. Our intention was to create a healthy treat for a breakfast on the go, to throw in your kids lunch box for an after school snack, or to slip in your jersey for the perfect pick me up after your 50 mile bike ride. That note made us HAPPY!!!!!!!! Easy. Yummy. Good for you. What more could you ask for? Every day there are challenges. I wish we had unlimited funds so it all felt less stressful. That said, we are doing something we really believe in, and we know we have a GREAT product and that keeps us excited and committed. Also I think that becoming a mom has softened me greatly, and made me more empathic and able to really listen to others. Those skills come in handy whether I am trying to finalize our packaging, buy a machine, schedule time in our kitchen, or to get us into a new store. It really is all about people. And people all want to be valued and heard. And they deserve to be. And when I do a good job of that, it helps my business, and it helps me feel good too. I am constantly reading the weekly articles to gain knowledge and support. Sometimes I learn something concrete about SEO, sometimes it’s just about not feeling so alone in this. I never ever imagined that I would be a business woman. I have a background in the arts, yet here I am. And I love all the support that Project Eve offers me! Be prepared to sample!!! Food is about taste, and people don’t know what your food tastes like until you give it to them! We try to sample at our markets as much as possible. Also, specialty food shows can be a great way to introduce what you have to offer. Most packaging places require huge orders. So don’t be afraid to start with some sort of temporary packaging in the beginning. The point is get out there, get people tasting.